Many a husband has suffered the wrath of his better-half for not changing the filter often enough. 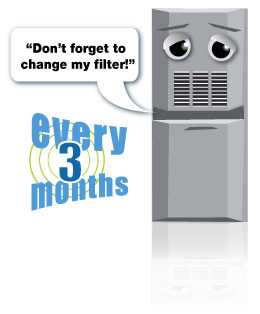 The Furnace filter has become a major component of the forced air heating and cooling system. Originally, a filter protected the furnace components and controlled some dust in the home, but nowadays, furnace filtration systems exist to control the family's exposure to air-borne particulates which can be harmful to their health. The EPA says that AIR POLLUTION IN THE HOME is higher than air pollution in the most industrialized cities. Air filters have evolved to help us combat this air pollution. Standard 1" disposable fiberglass filter. These capture only the largest particulates and some dust. Very cheap and very ineffective. 1" washable electrostatic filter. This filter creates a static charge that attracts dust, dirt, and some other particulates. This filter is NOT much more effective than a standard fiberglass filter. 1" pleated filter. This filter is a major step up from the fiberglass and electrostatic filter. The media material is much more dense and the filter's configuration has much more surface area. Can cost $5.00 to $15.00. 4" or 5" thick media filter. Great filtration. These filters have a thick pleated media which can greatly reduce airborne viruses, molds, and pollens by up to 80%. These filters fit in between the return air drop and the furnace, and can cost approximately $500.00 to have installed. These filters can be fitted with a MERV-10 to MERV-16 filter. The electronic air cleaner, the old stand-by, is still around. This type utilizes electrodes which magnetize particulates and collects them on the cells. These can eliminate as much as 94% of viruses, pet and human dander, mold and other small particulates. This unit installs for about $975.00. The High Efficiency Particulate Air or HEPA filter is considered to be the best. In order for a filter to be rated as a HEPA filter, the filter must remove 99.97% of air-borne particulates. This dense of a filter can affect the airflow of your system, though. Passive filtration system. This filtration system sits to the side of your furnace and removes a portion of your return air for filtration and replaces the filtered air back into the air stream. These systems often have a UV light to kill bacteria and are also often HEPA rated. These systems can cost as much as $1,500.00 for installation. One of the best available is a 5" media filter with an integral UV light built in. Most manufacturers have a similar model available. Often available with a MERV-10 to MERV-16 media filter. If someone in your family is plagued with respiratory illnesses, allergies or asthma, upgraded filtration is a must. Not all air-borne particulates are controlled, but the dust and air pollution in your home can be greatly reduced. Merv ratings for filters range from 1 to 16. 16 being the highest rating before the filter is considered a HEPA filter.